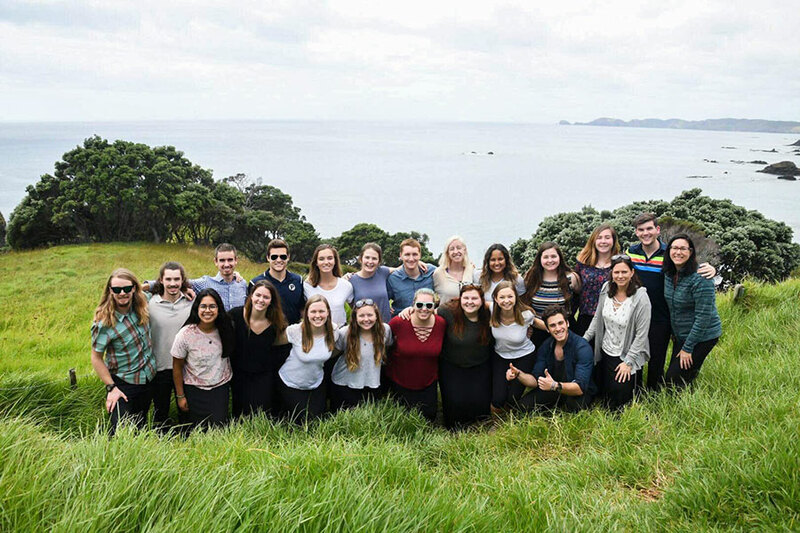 Utilizing the country’s stunning natural setting and storied past as a living classroom, students on the New Zealand Abroad dove deep into cultural anthroplogy (with a focus on Māori culture and language), conservation, and education. The group, led by multidisciplinary Professor Kim Hedge, biology professor Dr. Chrissy McAllister (C’93), and global studies professor Dr. Sally Steindorf (US’93, C’97), is back on campus now, completing research projects and sharing what they learned with the campus community. The abroad’s theme, “New Zealand: Isolation, Invasion, Intervention,” framed a study of the island nation first settled in the 13th century by Polynesians, who came to be known as the Māori people. Europeans arrived in the 18th century. “The reason the country is so fascinating to biologists is that it has been separated from other major land masses for about 80 million years—a really long time for plants and animals to be off on their own evolutionary trajectories,” McAllister notes. Students learned how the unique flora and fauna are threatened by ecotourism and other issues—and how NGOs, Māori groups, and government agencies are working to preserve New Zealand’s natural heritage. Experiential education activities included learning from professionals at Outdoor Education New Zealand who led Principians on a six-day backcountry trek in Nelson Lakes National Park. Students learned to read topographic maps, use hiking etiquette, and cook for hungry hikers; they also completed site-specific assignments and conducted group lessons. After climbing a mountain pass during torrential rain, they were rewarded with a gorgeous waterfall and spectacular views. Later they facilitated outdoor education lessons at a middle and high school. Other outdoor adventures included sea kayaking in Stewart Island National Park, snorkeling for sea urchins, a Māori-led whale-watching trip, and a silent, nighttime hike to find kiwi birds. Stepping into a more urban scene, the group spent a day searching for street art in Christchurch (Ōtautahi in Māori) on the South Island. Journaling throughout the trip afforded the opportunity to reflect and record the merging of conservation, education, and culture topics, among other observations. Read the Humans of New Zealand blog they created to introduce some of the fascinating people they met—ranging from a traditional Māori woodcarver to a professor at the University of Auckland. Another study abroad group will travel to Malta this summer. And during the 2018–2019 academic year, students will study with Principia in Greece, Turkey, Italy, Israel, Ireland, England, Iceland, Slovenia, and Croatia. See program descriptions.